Palladium is one of the rarest metals in the world. In fact, all of the palladium ever mined would comfortably fit in the average sized living room, per the CRB Commodity Yearbook. An extremely rare and precious metal, palladium is one of the few commodity metals eligible for inclusion in a tax-advantaged retirement account. Unlike U.S. dollars or equity claims, such as stocks and mutual funds, the value and uses of palladium are not dependent on prudent policy decisions from the U.S. government or Federal Reserve. If you are interested in palladium as an investment asset, read this short guide. Palladium, signified by the atomic symbol Pd, is a rare transition metal in the platinum group (PGM). Like all PGMs, palladium is dense and has a very high melting point (2,830 °F). It is also soft and resistant to oxidation and corrosion. Though it has many interesting characteristics, palladium didn’t hit its stride as a commodity metal until the 1970s. In the 1970s, major industrial countries (especially the United States) implemented new automobile emission standards. This meant makers needed new catalytic converters to absorb hydrogen and carbon monoxide. One metal stood head and shoulders above the rest: palladium. Over time, palladium found its way into dentistry, medical instruments, fuel cells, spark plugs, electrical components, and jewelry. Thanks to its important practical uses and attractive, soft-white appearance, palladium also emerged as a viable (and affordable) commodity investment alternative to gold and silver. Gold remains the most popular precious metal for commodity investing, both in the United States and internationally. Silver is probably the second most popular metal for precious metals investment. However, starting in 1997 with The Taxpayer Relief Act, American investors were allowed to include certain IRS-approved platinum and palladium bars and coins, along with gold and silver, in their Individual Retirement Accounts. You may realize several investing benefits by adding palladium to your retirement portfolio. For example, palladium is relatively unknown to the broader investing community. This means palladium bullion tends to have a lower spot price per ounce than gold, and it may be less subject to speculative price swings than more popular metals like gold and silver. Even if you already own gold and/or silver in your IRA, palladium can bring added diversity to your portfolio. Given its many uses and extreme rarity, palladium should have value long after any debt or currency crisis. Palladium is one of the four metals legally eligible for IRAs—including traditional IRAs and Roths (the others are gold, silver, and platinum). 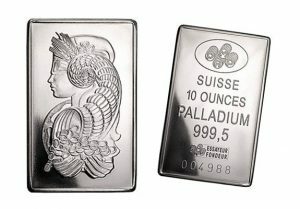 The IRS rules for adding palladium bullion (the real, physical metal in coin or bar form) are the same as those for a conventional IRA. You have to abide by the same contribution limits and suffer the same early withdrawal penalties. A palladium IRA allows you to add precious metals (silver, gold, palladium, platinum) so long as your bullion meets the IRS’ minimum fineness and requirements. You must keep your physical investment assets (i.e. precious metals) in an IRS-approved depository or storage facility until you are eligible. It is critical that you check with your IRA custodian before buying palladium (or any precious metal). Many custodians are not set up to accommodate precious metals and may force you to cash out or transfer. As a prudent investor, you should speak with a qualified tax accountant before making any major adjustments to your IRA (or other retirement assets). The IRS is not particularly forgiving to those who misstep while handling retirement accounts — ignorance is not a defense. Note that you cannot add palladium (even IRA-approved palladium coins and bars) that you already own, unless they are part of another IRA. If you have more questions, call our experts at American Bullion. Our goal is to help you make an informed decision and, if appropriate, we’ll handle all the steps for you—hassle free! Grab control over your own retirement. Let us work with you to determine if palladium bullion (or any other precious metal) can help secure your financial future. We take great strides to ensure our services are transparent, safe, and efficient.